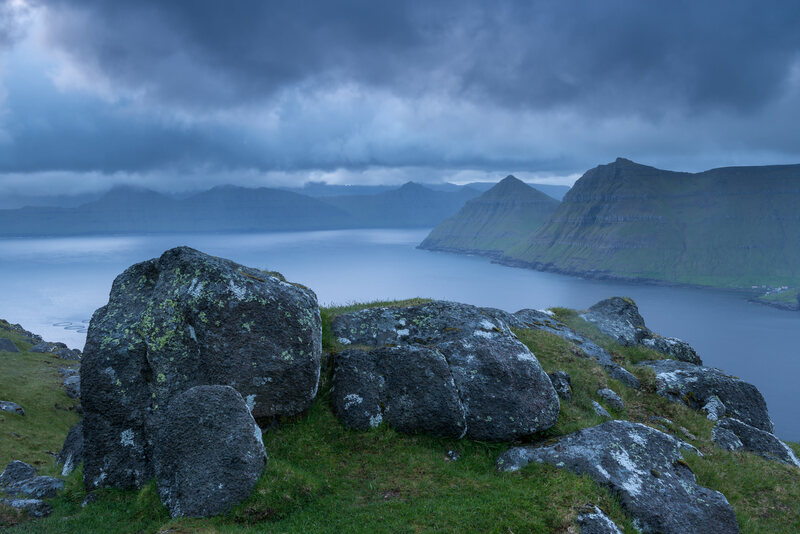 I’ve recently returned home from a really enjoyable four day trip to the Faroe Islands where I was providing a private 1-2-1 tour of this dramatic landscape for a client. Fortunately for me, my client insisted on me taking advantage of the beautiful scenery so I have returned home with lots of new pictures to add to my Faroes portfolio. 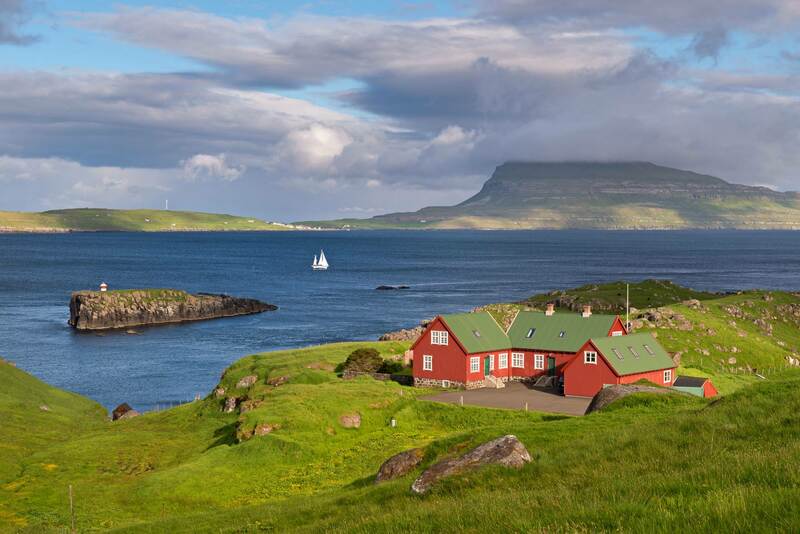 I first became aware of the Faroe Islands many years ago when attending a travel show in London. As I walked by a Faroes tourism stand my jaw dropped in disbelief as I saw large format photographs of the unbelievably dramatic coastline. I had never seen any coast quite like it and struggled to comprehend how such an amazing landscape could be so close to home, and yet almost completely unknown. 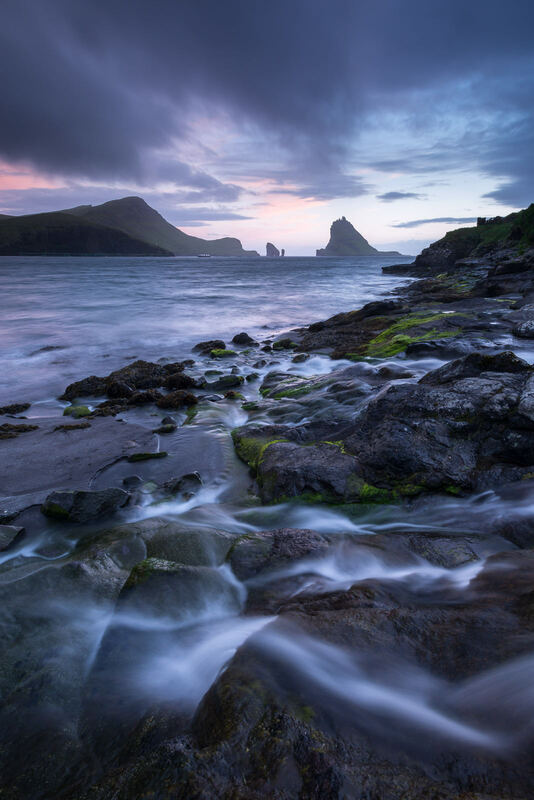 Since my first trip back in 2012 I have been extremely fortunate to visit the Faroes five times now and each year I lead workshops to the islands with Tatra Photography. Although their popularity with visitors and photographers alike is growing fast, you can still consider yourself unlucky to share a location with another photographer. Just the tonic in today’s crowded world of landscape photography! 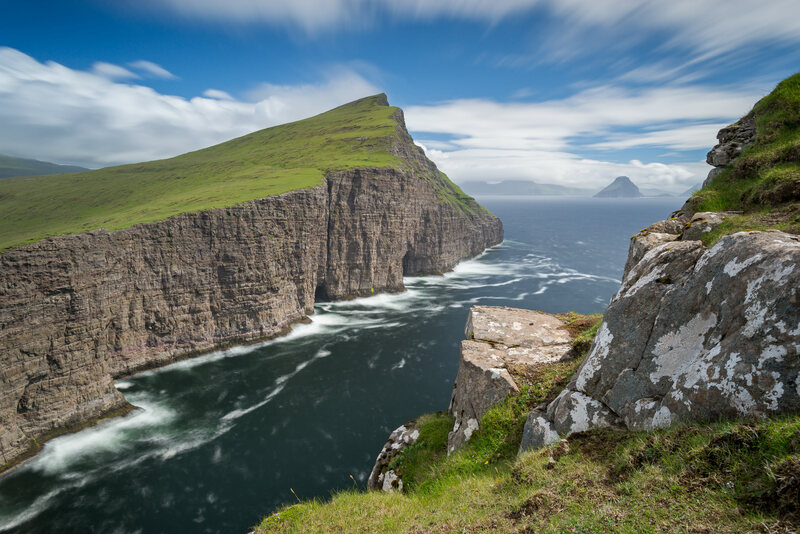 On this latest trip, we spent four busy days exploring the three largest and most accessible of the Faroes eighteen islands, Vágar, Streymoy and Eysturoy. Getting around these islands couldn’t be simpler; the roads are all kept in beautiful condition with a network of tunnels providing access beneath the sea or through mountains. Like the UK, the weather is always a consideration in the Faroe Islands. Even in summer the weather can be unpredictable and extremely changeable. I’ve photographed snow in June on a previous trip! On this trip we were lucky to experience more than our fair share of sunshine, plus some special conditions around sunrise and sunset. While we were fortunate, challenging weather is extremely well suited to photographs of the dramatic landscapes so don’t feel too downhearted if you encounter cloud filled skies and regular downfalls on your trip. Being so far north, sunrise and sunset can be problematic for photographers, especially at this time of year. 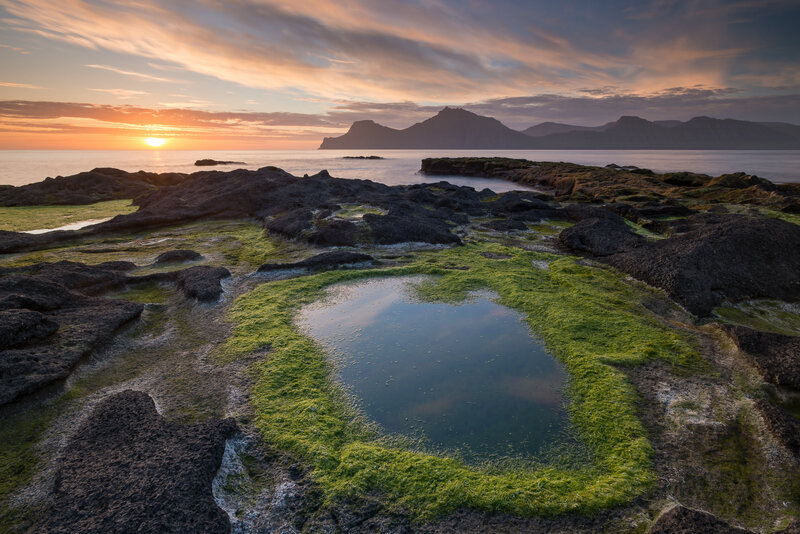 Our visit coincided with the summer solstice which was particularly punishing; a pink sunset sky over the Gjógv coastline at midnight was followed by 1.5 hours sleep before resuming positions at 02:45 in good time for sunrise. Ouch! 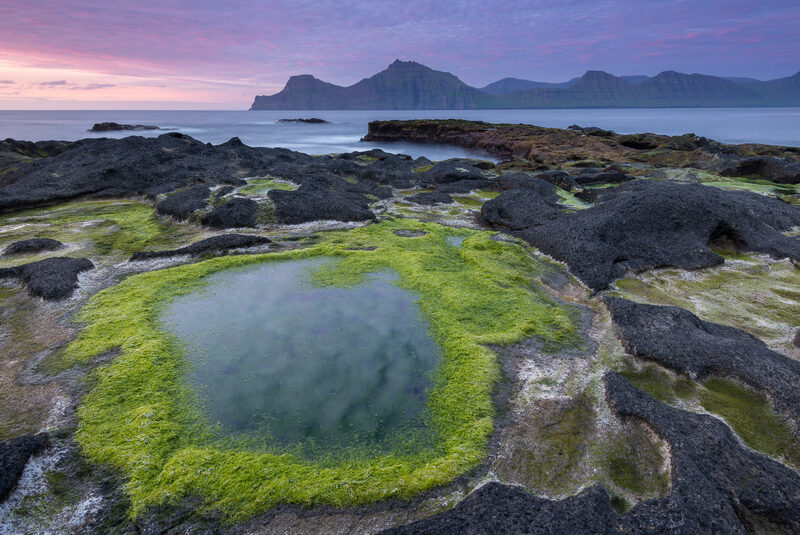 The Faroes make a wonderful destination for landscape photography; they are just an hours direct flight over the Atlantic from Edinburgh. If you would like to attend a photographic workshop in the Faroes please check out the Tatra Photography website. If you would like a private tour, please contact me for more details.